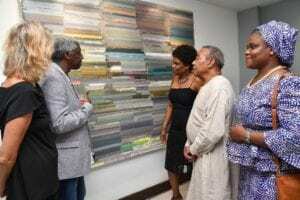 Internationally acclaimed Jamaican artist Professor Bryan McFarlane (2nd right) has the rapt attention of (l-r) Minister of Tourism, Hon. 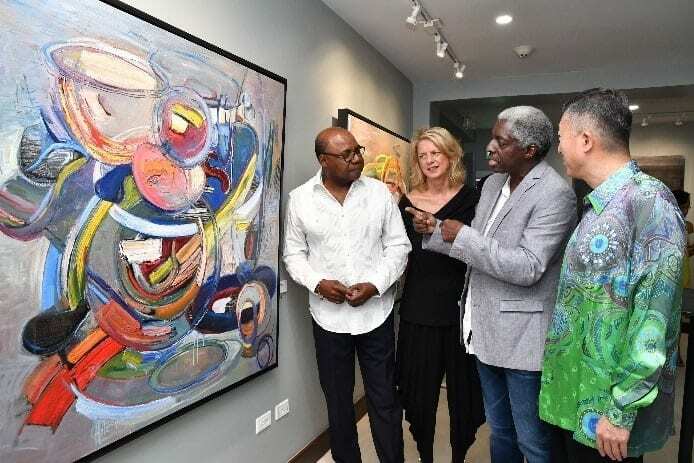 Edmund Bartlett, Canada’s High Commissioner to Jamaica, Her Excellency Laurie Peters and China's Ambassador to Jamaica, His Excellency Tian Qi as he explains the inspiration behind “Bicycle Abstraction”. The occasion was the closing ceremony for Professor Bryan’s “New Beginnings” exhibition and the opening of the Gene Pearson Gallery at The R Hotel, New Kingston, on Saturday, April 13.